Festival Report: Narasimhadeva's App Day ~ The Toronto Hare Krishna Temple! Narasimhadeva Appearance Day Festivities Roar with Enthusiasm! 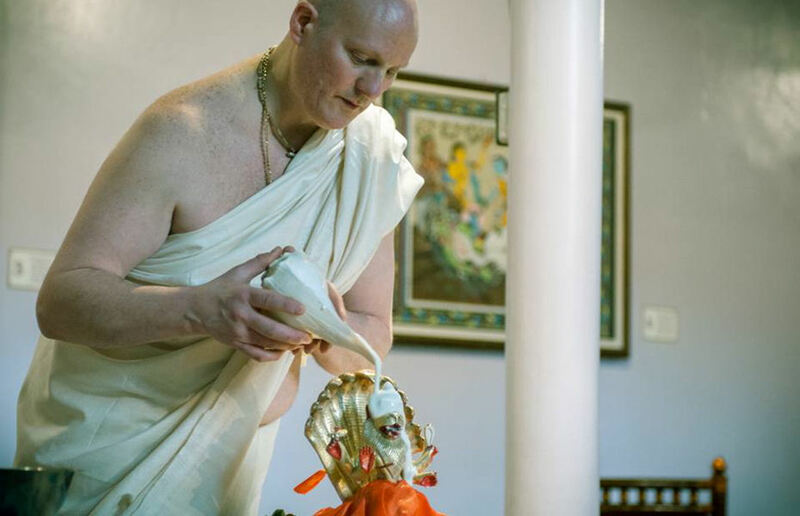 On Friday, May 20, 2016, Toronto's Hare Krishna Community celebrated the appearance day of Lord Narasimhadeva - Lord Krishna's half-man, half-lion incarnation. Lord Narasimhadeva descended to protect his young devotee Sri Prahlada Maharaja from his torturous father, King Hiranyakashipu. There are many prayers to Lord Narasimha that invoke powerful mantras for protection, appealing to the Lord's half-lion incarnation and His weapons. These are for protection from such things as malevolent spirits and material desires, as well as increased devotion and a peaceful world. The festival kicked off with a lively kirtan and was followed by an enthralling class by Vaisesika Prabhu. The class focused on this most munificent form of the Lord and devotees were hanging off every word of our guest speaker. Following the class, Lord Narasimha made a divine appearance, much to the delight of the crowd (and likely to the terror of some children... sorry!). As Lord Narasimha exited stage left, a beautiful abhisheka (bathing ceremony) took place wherein a small form of Lord Narasimha was bathed with various items. This was done amidst thumping kirtan! After an exuberant kirtan, a delightful vegetarian feast (prasadam) was served to one and all!